People with diagnosed diabetes incur average medical expenditures of ∼$16,750 per year, of which ∼$9,600 is attributed to diabetes. 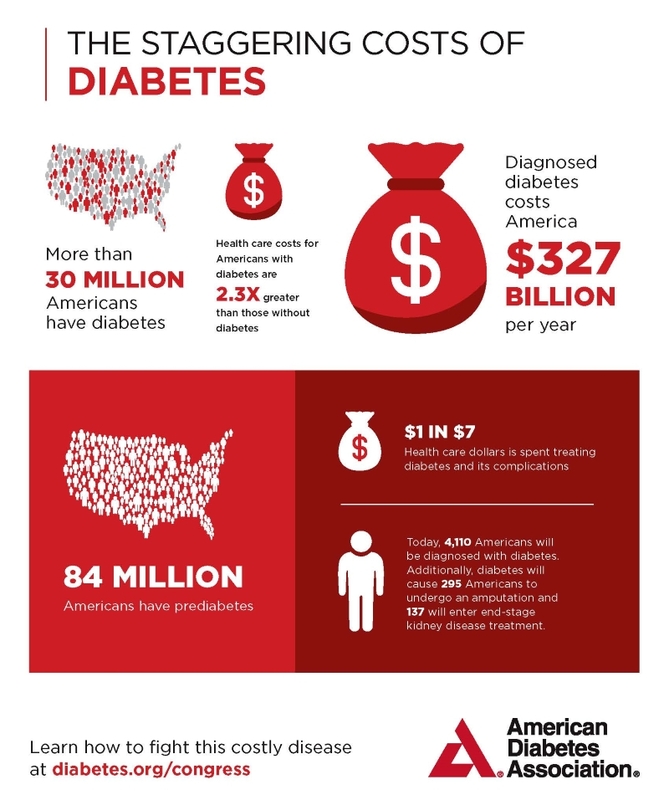 People with diagnosed diabetes, on average, have medical expenditures ∼2.3 times higher than what expenditures would be in the absence of diabetes. $10,000/year, just for your diabetes, not any other disease you may have. Some of that can be covered by insurance. Still, there are copays, coinsurances, deductibles (a $5000 deductible is ludicrous), out-of-network costs. Drugs (metformin and sulfonylureas to start then the more costly DDP4 inhibitors up to crazy-costly insulin). Supplies and devices (meters, strips, lancets, syringes, monitors, pumps, special glasses, stockings, shoes, and over-the-counter drugs like Advil and antacids because diabetes makes your body ache/neuropathy and your stomach hurt/gastroparesis). Before the Affordable Care Act (ACA also know as Obamacare) insurers could deny people with diabetes a policy, reject them outright, because they had a pre-existing condition. (Also … Did you have a stroke? Heart attack? Cancer? No policy for you!) Obamacare made that illegal. Trump campaigned on getting rid of Obamacare, getting rid of these protections for pre-existing conditions. It was a focal point of his campaign. People carried anti-Obamacare signs. Millions of people voted for Trump in the hopes he would abolish it. It looks like they may get their wish. A federal judge in Texas ruled that a provision of Obamacare is unconstitutional, so the whole thing would go away. I think I get why Republicans are so against protections for pre-existing conditions. It means insurers can go back to denying people coverage, increasing both their bottom lines and the pockets of those who invest in them. While much of the cost of diabetes appears to fall on insurers (especially Medicare) and employers (in the form of reduced productivity at work, missed work days, and higher employer expenditures for health care), in reality such costs are passed along to all of society in the form of higher insurance premiums and taxes, reduced earnings, and reduced standard of living. It behooves us, as a society, to care. To make default choices the healthiest choices. To improve school lunches so children have a leg up on their health. To study and then regulate the hundreds of chemicals that act as endocrine disruptors (EDs). To reduce pollution. To design safe walking paths in cities. To offer affordable housing. To reduce wealth inequality. To subsidize not just commodity crops like corn and soy, but fruits and vegetables, so more people can access them. To apply the standards of organic farming to all food crops (because pesticides act as endocrine disruptors and EDs have been shown to increase risk for diabetes). All of these things, and more!, would reduce the incidence of diabetes. This entry was posted in Uncategorized on December 16, 2018 by Bix. I have studied dialysis facilities a little in my research. One thing I would recommend is to check out the Dialysis Compare website: https://www.medicare.gov/dialysisfacilitycompare/. This site is run by CMS and allows you to see the clinical quality records and other information to help you pick out the best facility for care in your area. This is great information. Thanks for putting it up there, David.